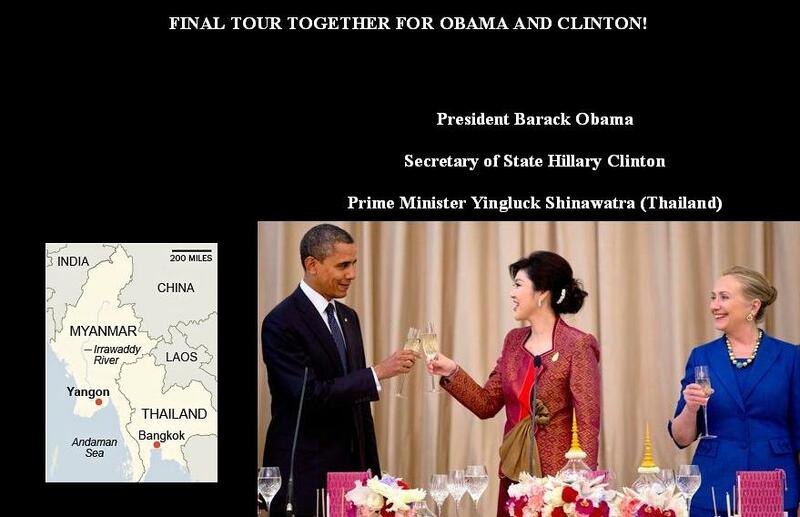 President Obama and Secretary of State Hillary Clinton final tour as Partners! PHNOM PENH, Cambodia — They emerged from Air Force One together, side by side, smiling at the crowd waiting on the tarmac below. Then as they headed down the stairs, she held back just a little so that she would stay a step behind him. For President Obama and Secretary of State Hillary Rodham Clinton, this week’s trip to Southeast Asia is to be their last foreign adventure together in office, an intriguing, sometimes awkward closing road show that is nostalgic over a partnership at an end yet hints at a future ripe with possibility. Four years after their cage-match battle for the presidency, the rivals-turned-allies proved a more compatible team than either might have imagined when Mrs. Clinton first accepted his invitation to join the cabinet. Though not exactly close friends, they developed a working relationship of respect, one in which Mr. Obama gave her the freedom to roam the world while she strategically deferred to him in ways small and large as she carried out his policies and shaped her own. Mrs. Clinton’s signature initiative as America’s top diplomat is what has become known as the administration’s “pivot to Asia,” a strengthening of United States strategic, security and economic ties in the Asia-Pacific region. It is a policy Mr. Obama advanced with his three-country trip that began Saturday and included two nations never before visited by an American president, Myanmar and Cambodia. Now as the president prepares to begin his second term, the secretary is stepping down, bone weary, according to aides, and ready for an extended rest after nearly a million miles of globe-trotting. She has waxed about the days not far off when she can relax, read a book and even travel just for pleasure. But many on Air Force One these last few days, not least the president himself, expect her to be back after a rest, making a bid to succeed him in 2016 and redefining their relationship once again. As the last day of the trip arrived on Tuesday morning, Mrs. Clinton reflected briefly. “It’s been great,” she told reporters who stopped her in a hotel before heading out to summit meetings. “It’s been bittersweet, nostalgic, all the things you would expect.”Mr. Obama, too, has seemed to focus on the journey’s nature of finality, making a point of praising Mrs. Clinton publicly as they have jetted across Southeast Asia. They met up in Thailand and then traveled together on Monday to Myanmar and finally here to Cambodia. Along the way, they teamed up to meet with premiers and potentates, tour an ancient golden pagoda and chat with a Buddhist monk about budget deficits and maybe even presidential politics. On the porch of the house of Myanmar’s opposition leader, Daw Aung San Suu Kyi, Mr. Obama gave Mrs. Clinton a shout-out. She caught his attention from the audience. “There she is,” he said to applause. Mrs. Clinton, as is her style, has kept publicly quiet during the trip, leaving the president the stage while she has largely remained behind the scenes or in the audience. When the two arrived at Ms. Aung San Suu Kyi’s house, she hung back while Mr. Obama emerged from the limousine to be greeted. And yet at times, her deeper experience in remote places around the world like this is palpable. After Ms. Aung San Suu Kyi shook Mr. Obama’s hand and began to draw him inside the house, she abruptly stopped as if remembering, turned around to look for Mrs. Clinton and then rushed over to give her a warm embrace. While Mrs. Clinton was seen as an old friend, Mr. Obama later appeared to mispronounce Ms. Aung San Suu Kyi’s name; she flinched but later hugged him. An American woman next to Mrs. Clinton indicated that the gift was for Michelle Obama. “She’ll look very good in that color, Mr. President,” Mrs. Clinton offered. Thick in the air, if largely unspoken, was the question of Mrs. Clinton’s future. When the president and secretary went to the Wat Pho Royal Monastery in Bangkok to look at the famed Reclining Buddha, a monk told Mr. Obama that the statue was a symbol of success and would bring him a third term were he allowed to run. The Thai newspaper The Nation reported that the president pointed to Mrs. Clinton and said she would be the next president. Aides to both denied that, suggesting that the monk, not the president, may have forecast Mrs. Clinton’s future. Either way, as the end drew near, the past and future were on the minds of both. Mr. Obama took Mrs. Clinton and her entourage to lunch at the United States Embassy in Yangon, Myanmar, on Monday to thank them for their work. Then during the Air Force One flight to Phnom Penh that night, an official said, the two huddled alone for an hour, reminiscing about the last four years — and talking about what the next may bring.